We are having great spring weather this week and rest of the 7 day forecast is on the + side. Half the land is out from under the snow, so it really feels like spring. At this rate we may not have any snow left by the end of the week. But we will get more snow someday. We have been knew-en to get snow in May and stick around for a few days after. I have been working on my Yellow Spring Tulips. I also did a few Bees to go with them. I have a box with all colours of butterflies so they may end up all together in one quilt. The grey dot fabric is so cute. I got a scrap from my mom about year ago. I like the grey better then if it had been a black. I do not have much grey. This tulip had to be fussy cut to get the yellow. It is a pastel rainbow fabric and the yellow is not very big. I had made one mistake and had to see if there was enough yellow left to re-cut 1 more piece. I got it done. I have added this to Soscrappy's Saturday Linky page. 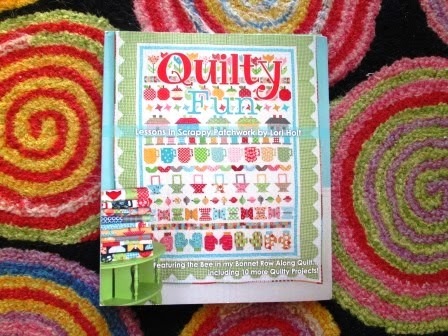 All of today's blocks are from this book Quilty Fun. I have plans to do a few apples and then apple cores with the yellow apple flesh showing. I think I have all the parts cut out now for 3 apple core blocks. That might be today sewing between all the driving kids around today. One son is working with friends in town on the science fair project. The oldest is off to a party tonight and wants to be driven and picked up late. 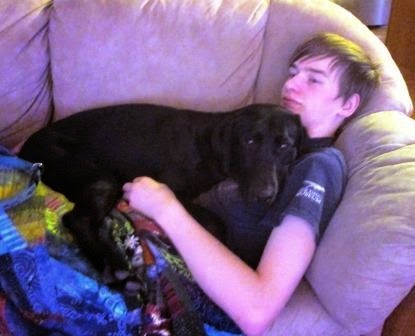 Gemma and my son cuddling with a quilt. Adorable wonderful blocks! (and i love the fabric too) fun choices. Your bees and tulips are sweet! I love that book and can't wait to get her new one next month. Oh my those flowers are just adorable. Here in our city, we've got no snow and +19C days. We are loving it. We haven't had hardly any snow this year and we've had no snow for weeks now. Glad to hear you guys are warming up too. The flowers and bees are wonderful - so happy. 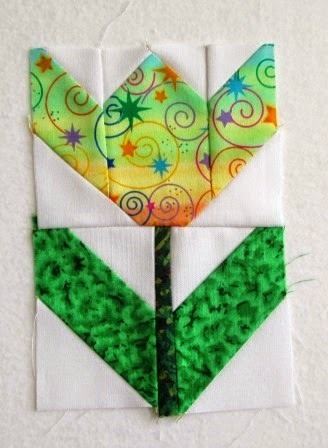 Love your idea of using the Quilty Fun blocks for the challenge. So cute! 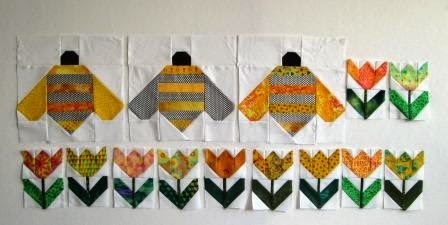 Bees and butterflies and tulips should make a great quilt. What fun blocks, love them all. Bees are so cute!!!! Great blocks! What happy blocks. Looks like a great book to have on hand. Oh gosh, this looks like spring! What sweet looking bees. Love your bee block! I don't have much grey in my stash either. 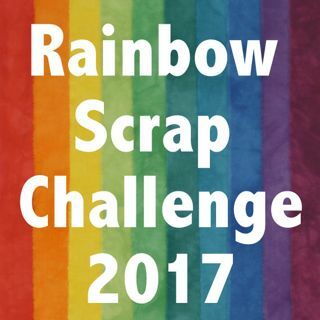 Hope it doesn't come up as a color for the Rainbow Challenge! I have the print you used in your fussy cut tulip but with an entirely white background. I rather like your tulip though. Great collection of bees and tulips. I love the rainbow fabric you used in that tulip. 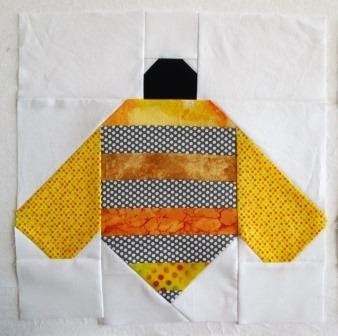 Your bee blocks were perfect to celebrate YELLOW this month!! So adorable! Beautiful flowers and honey bees. I have that book and love it!